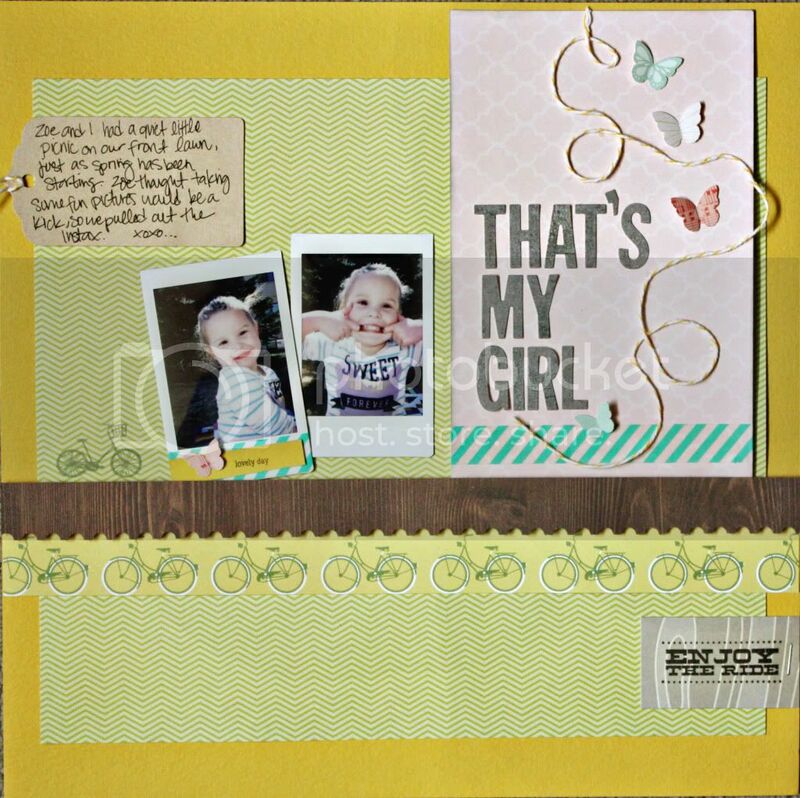 I'm in LOVE with the new stamps from the April Studio Calico kit, as well as the bicycle paper. (Still available HERE) These pictures are from a picnic Zoe and I had a few weeks ago, during a warm afternoon. She loves my Instax camera, probably because it looks like a toy, but she insisted I take some pictures of her and this is what I got. One smile, one crazy face - which is totally normal Zoe. Our town is rather small, and we are looking forward to summer evenings spent riding around to the park and to get ice cream. I've found a bike I'm in love with - a cruiser style, and we pulled out Zoe's tricycle today. She's still learning how to control the handles and steering, but she's getting better. We took a little ride around the block after lunch, and again just a few minutes ago. Hopefully we can get to the park soon, where they have a flat sidewalk, ours is all chunky and bumpy. Super cute layout. My box arrived last night so I am looking forward to opening all the goodies at nap time. My two year old sneaks the instax and takes very random self portraits! She loves it! What a beautiful layout Holly, and your town sounds perfect for bike riding with a beginner. Loving the photos!